Beijing, China, 29th January 2018—China’s ivory trade ban was hailed as “a milestone in wildlife conservation worldwide” at a major international workshop co-hosted by WWF, TRAFFIC and the China Wildlife Conservation Association in Beijing today. 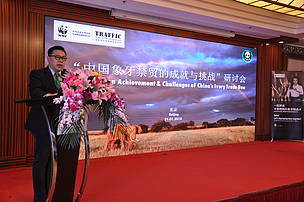 The workshop was attended by 110 people, including representatives from China’s State Forestry Administration, the Convention on International Trade in Endangered Species of Wild Fauna and Flora Management Authority (CITES MA), Foreign Ministry, enforcement agencies including China Customs and Forestry Police, the ivory carving industry, academia and businesses, WWF, TRAFFIC, and major NGOs operating in China. On 31 December 2017, China where ivory carving has been important to national culture for over 2000 years kept its promise and closed its legal ivory market. The move has been widely praised as potentially a game changer that might help to reverse the decline of wild African elephant populations. According to a recent rapid market visit, all registered ivory sale and processing sites had ceased their processing and sale of ivory and ivory products by the timetabled deadline indicating that the ivory ban is on track. At the one-day workshop, WWF and TRAFFIC presented key findings of major research conducted last year. TRAFFIC’s report: Revisiting China’s Ivory Markets in 2017 shows the number of ivory items offered for sale—in both legal and illegal ivory markets in China has declined alongside falling ivory prices after the announcement of timetable of the ban. Further to this, a joint survey by WWF and TRAFFIC’s: Demand under the Ban: China ivory consumption research 2017, examines ivory consumers’ attitudes in the context of the ban. Research found the ban has widespread public support and is likely to reduce consumers' ivory buying substantially, although public awareness is very low. Ivory purchases have dropped in many cities surveyed where regulations might be stricter and there is more awareness about the ivory trade ban, especially in Beijing and Chengdu, but ivory buying has been moving from these major cities to regional cities in China over the past three years. Several panel discussions were held on law enforcement, demand reduction, inheritance of ivory carving and the role of NGOs in supporting China’s ivory trade ban. While recognizing the achievement of the Chinese ban, delegates identified strengthening law enforcement capacity to combat illegal trade, especially that which occurs through social media channels, and reduce market demand as the key challenges for effective implementation of the ban in the future. And they highlighted the need to increase the awareness of tourists that bringing ivory back into China is also illegal. At the workshop, local ivory industry representatives recognized that ivory carving is regarded as China’s intangible cultural heritage and argued that the ivory ban is a sacrifice China has made for the sake of the survival of African elephants. They highlighted the need to carry-forward ivory carving skills in a non-commercial way. 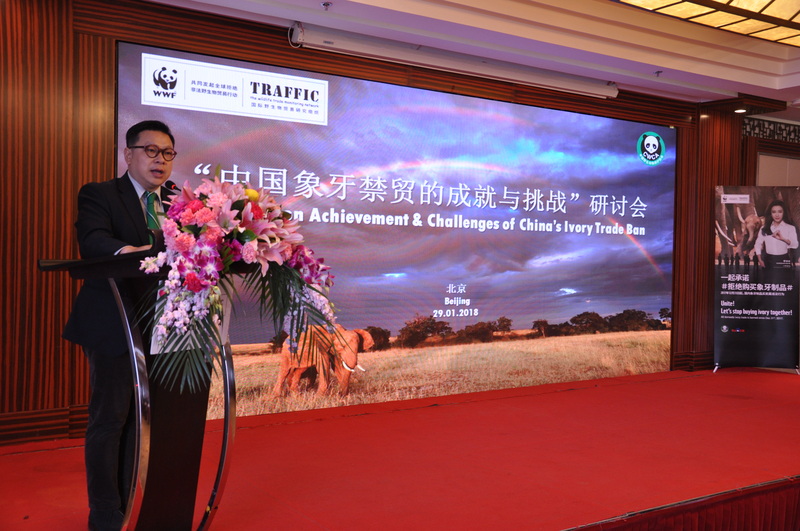 The Beijing workshop is part of a series of workshops WWF and TRAFFIC have been hosting in China to promote and support the ivory trade ban, the first of them held in Beijing in 2015, and subsequent ones in Xishuanbanna in March 2016 and Chengdu in October 2016. TRAFFIC, the wildlife trade monitoring network, is a leading non-governmental organization working globally on trade in wild animals and plants in the context of both biodiversity conservation and sustainable development. TRAFFIC works closely with its founding organizations, IUCN and WWF, making a critical contribution to achievement of their conservation goals through a unique partnership.